The Michael Schwartz Library invites you to explore its audio and video collections in Multimedia Services. 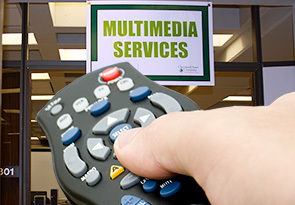 To insure that the materials you need will be available to you when you need them, please reserve videos in the library's collection as soon as possible by calling Multimedia Services at 216-687-9337. Please contact Edith Creighton at e.creighton@csuohio.edu or 216-687-2142 if you have any questions. Permanent link to this topic. Posted 2016-08-24 14:18:31. Reply to Lauren_Felder. Categories: Library News. PROQUEST SERVICE ALERT : ProQuest Databases Will Be Unavailable from 10 PM Sat. to 6 AM Sun. August 20-21. On Saturday August 20, 2016, ProQuest will be performing maintenance to upgrade its infrastructure and enhance security. The maintenance is scheduled to begin at 10:00 PM EDT and will last for eight (8) hours. Permanent link to this topic. Posted 2016-08-15 07:07:27. Reply to Lauren_Felder. Categories: Library News. SYSTEMS ALERT : Electrical Outage to Disrupt Library Web Services Sat. August 13th beginning 6:30am. Due to a planned electrical outage in Rhodes Tower, the following Library web services will be off-line beginning 6:30 AM on Saturday August 13th. Permanent link to this topic. Posted 2016-08-08 13:58:45. Reply to Lauren_Felder. Categories: Library News. Showing posts from August 2016 only. Display other dates.